Mike and I love cruising! Unlimited food. Travel to multiple places. Ocean views. Basically, resort life on a floating hotel. The three cruises we’ve gone on together have all been with NCL Norwegian Cruise Lines—our honeymoon cruise along the New England / East Coast on the Norwegian Gem back in 2013, a Caribbean cruise with my family on the Norwegian Getaway in 2015, and most recently (fall 2018), a Western Mediterranean cruise on the Norwegian Epic to celebrate our five-year wedding anniversary! We would highly recommend Norwegian Cruise Line because of its Freestyle Dining and Entertainment—eat whenever, activities whenever, basically the cruise ship take on “you do you” lol. (Learn more about NCL Freestyle Cruising). 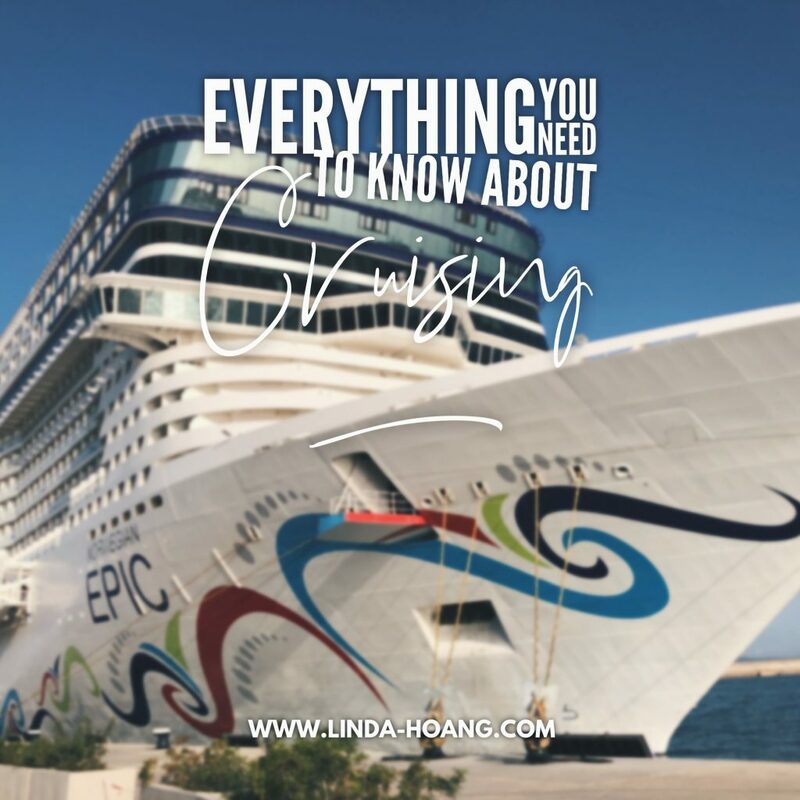 While this post is for cruising in general, as our specific experiences are with Norwegian Cruise Line, my perspectives and advice is based on what we’ve experienced with NCL cruises. I also cover what we did on our most recent cruise in the Western Mediterranean. Note: Norwegian Cruise Line offered us free Wi-Fi on our recent cruise, but this post is not sponsored by them! If you have any additional questions after reading, feel free to leave a comment or message me on social media, and I can also add additional sections to this post! For us, we love the convenience of a cruise. We love that a cruise can take us to multiple different spots without any effort on our end. It’s easy. It’s convenient. You get a great taste for a place before deciding whether you want to come back and spend more time there. We also love the resort-style. On a cruise, your accommodations are included. Your dining is included. Your entertainment is included. There are additional charges if you want certain things, for example, Norwegian features regular as well as Specialty Dining restaurants. If you want to eat at a Specialty Dining spot, you’ve got to pay a cover charge, or buy one of their Specialty Dining packages. However, you could also go the whole cruise just eating at their multitude of included restaurants. Cruising gives you the resort feel, but on a ship that also takes you to different places, so for someone like me, who enjoys resort life for maybe a couple days before I’m bored, it’s great because the stops at ports add an extra element to the otherwise leisurely vacation. Ultimately though, cruises give you lots of choices for how you want to vacation. You could literally stay by the on ship pool every day of your cruise. Or you could do excursion after excursion after excursion at each port. Or you could do a mix. For us, cruises give you the flexibility to do a little bit of all the things that you might enjoy on a typical vacation. Mike and I booked this cruise almost a year in advance (January, for an October sail date). Even at that time, a lot of rooms had already been taken, and a lot of the cheaper base fares had also been snapped up. At the time of our booking, Norwegian was offering two “Free at Sea” packages included with your booking. Packages like specialty dining, unlimited beverages, and Wi-Fi, which would normally be additional costs on top of your base fare. That was an awesome perk for us! I noticed in the months leading up to our sail date, that NCL was offering included flights with your booking (depending on the itinerary you picked). That wasn’t an option when we booked. The earlier you book, the better your room and price options will be (probably). The deposit to hold your booking is not much, a couple hundred dollars. We didn’t need to pay the full amount until July (before the October cruise). I also liked that we booked well in advance because so many things can happen leading up to your cruise—finances might change, or maybe if it was closer to sailing you’d think, oh it’s not a good time. Because it was booked in advance, even though we could have argued that it wasn’t a great time to go anymore, it was nice that we were committed and I’m so glad we went. Be sure to sign up for newsletters for the cruise lines you’re interested in, and start receiving their deals and notices well in advance of when you think you’ll book! Cruise lines do offer Wi-Fi on the ship. Hallelujah! You can buy packages based on minutes, or you can try to include it as one of your freebies when booking. The Wi-Fi signal is solid too. Mike used it to watch anime before bed some nights (lol) and I liked to use it obviously for social media updates from the ship. When we were at port in different European towns and cities, we relied on TELUS Easy Roam Package for easy data and calling. For a small fee per day you can use your phone as if you’re at home! It was really handy, and helpful for making sure our Instagrammable vacation moments could be shared easily online. Note: I am a #TeamTELUS ambassador, so I wanted to specifically highlight TELUS’ Easy Roam Package during the Internet section of this post. I can’t travel without being connected, and TELUS definitely had Mike and I covered on our trip when we weren’t on the cruise ship. But when we were on the ship, the Wi-Fi is really nice, and increasingly I find more cruisers choose the Wi-Fi as an add-on or extra in their cruise package! What are you feeling? A Western Mediterranean cruise was a perfect way for us to experience Europe for the very first time. We got to spend some time in Italy before and after the cruise, and visit France and Spain as part of the cruise. Is there a place you really want to visit, but maybe don’t think you need to spend a long period of time there? Lots of people will only cruise in hot places. That’s why the Caribbean is such a popular cruise destination. Our New England cruise in October was pretty chilly, but was also really nice to see autumn along the coast. Some people would love to see Alaska on a cruise, while others cringe at the idea. There are so many cruise stops all around the world, and they happen almost year-round, take your pick! It could be the only vacation you take, or it could be part of a vacation. It works as both. Mike and I use cruises as an entry into a region we’ve never been before. We’ll likely keep doing that! WILL YOU GET SEA SICK ON A CRUISE SHIP? If you get motion sickness in general, you’ll likely feel a bit sea sick during days at sea. That’s really the only time I can feel the ship moving. Otherwise, the cruise ships are so big and stable, you hardly know you’re moving at all! It’s amazing. I’d say for the most part (depending on how prone to motion sickness you are), you won’t even feel it. If you are prone to it, be sure to pick cruise itineraries that don’t have too many days at sea, or too many back-to-back days at sea. Our Western Mediterranean itinerary only had one full day at sea, which was good for my sort of motion sickness. DO YOU EVER GET BORED ON THE CRUISE SHIP? We are never bored on cruise ships, particularly the Norwegian ones, because they literally offer activities from the crack of dawn to late night. And they are activities that appeal to a wide range of ages and interests. There is live music, group work outs, comedy, theatrical performances, trivia, presentations about the cruise ship, dance parties, and much more! They are at all times of day, and free to participate, and it’s completely up to you what you want to do. For our first two cruises, Mike and I did a lot more of the activities. For our third cruise, we did a lot less. Sometimes you like planning out the morning, afternoon or evening. Other times you just want to sleep in, sit by the pool, or go to bed early. Norwegian calls it Free Style. But the point is, if you want to pack your day with activities, you can! If you don’t, you don’t need to, but the activities are there to keep you busy and entertained if that’s what you want or need. There’s never a dull moment on a cruise ship if you don’t want there to be! And that’s just all the excitement available on the ship! At each port, it’s really up to you how much excitement and exploration you want to do. It’s totally up to you. You can book excursions or you can just relax on the beach. You can explore a town or hop on a train and visit somewhere hours from the cruise ship. It’s as exciting as you want to make it but you certainly have lots of options! CAN YOU BRING KIDS ON A CRUISE? SHOULD YOU? It depends on the type of vacation you want, but yes, cruise ships (and most cruise itineraries) are totally kid-friendly! In fact, cruise lines like Norwegian have spaces that are strictly designed for entertaining kids—teen hang outs, kid daycare. If you wanted, you could drop your kid / even baby, off at the “Splash Academy” for supervision all day. Some itineraries lend itself more to kids/families. You’ll likely find a lot of families on summer cruises. You’ll definitely find families on Disney cruises. Other times of year, kids will likely be in school, so you won’t see too many. There are also adult only venues or times for different activities (like the dance club after 10 p.m. will only be adults, for example). Some cruise destinations you’ll only find seniors (lol), whereas some are considered “booze cruises” for young adults. Most you’ll find a mix of ages, like our Western Mediterranean. Though, most cruise passengers tend to be older in age, cruises can definitely be great for any age, and can accommodate for any age, just do your research before you book if for example, you really want a young adult cruise, or you want to avoid kids or seniors. Learn more about Norwegian’s Splash Academy / youth programs. IS THE FOOD GOOD? IS IT REALLY UNLIMITED? Cruise ship food, for the most part, is great! And it really is unlimited. On Norwegian, they have a buffet, a pub, two main dining halls for three-course dinners, and a bunch of Specialty Dining restaurants. On the Epic, those Specialty Dining spots included a Japanese Teppanyaki restaurant, Brazilian Steakhouse, regular Steakhouse, Sushi, Chinese Restaurant, Italian Restaurant and French Restaurant. I am obsessed with the Brazilian Restaurant it is soooo delicious, and Mike loves Teppanyaki. You’ll find the Specialty Dining spots offer a higher quality of food than the included restaurants, but there will always be really good food at the regular spots too. For us, for example, the buffalo wings at O’Sheehans Irish Pub (open 24 hours) were delicious. As was the Thai salad and Asian soup from the garden buffet. Some things were hit or miss (sometimes chicken was really dry. Other times it was good lol, for example). We had breakfast every morning in the buffet—I switched the type of eggs I had each morning, because there would be hard boiled or scrambled, fried or omelette, eggs Benedict or baked. Our first cruise was when I excitedly discovered I could order two appetizers and two entrees at one of the ship’s main dining restaurants. DO YOU GAIN A LOT OF WEIGHT AFTER CRUISING? There’s something called a “cruise diet” you need to be careful of, because I definitely gained weight after all the food I ate on our first two cruises.This third time around, I did a lot better with portion control lol. But it’s really up to the person how they want to approach their vacation. Luckily for giant cruise ships, there are a lot of stairs you can climb just naturally to get to your state room, and up or down to a specific dining or entertainment area. I still remember an avid cruiser we met, telling me that their “cruise rule” was to never take the elevators on a cruise ship. This would force them to keep a nice balance of activity to food consumption. On this third cruise, Mike and I climbed the stairs a lot. A little of it was to balance out the food we were eating, a little of it was because sometimes the elevators take so long to come to your floor because most people do not implement this stairs cruise rule lol, so it can be a lot faster to take the stairs. I’d encourage you to do the same! Additionally, cruise ships have gyms (the one on the Epic is massive! We looked at it, but never actually visited lol). They also have a jogging track which takes you outside, around the cruise ship, and they have different fitness activities each day you can partake in. Lots of options to keep yourself physically fit while feasting on food. It just depends on what you want to do! Honestly, it’s your vacation and cruises are really sort of designed to give you access to all sorts of culinary delights, so don’t feel like you NEED to work out to eat. Everything in moderation, but sometimes you should just be able to let go and enjoy without any guilt! WHAT ABOUT FREE DRINKS? FREE FOOD, FREE DRINKS? Unfortunately alcoholic beverages are not included with the free food you get on a cruise ship. Unless you have an Unlimited Beverage Package (it might be called something else on a different cruise line), then only non-alcoholic drinks are included with your cruise fare. Unfortunately, beverage packages need to be booked for everyone staying in your state room, so for Mike and I, it didn’t make sense to purchase for our first two cruises because I know I don’t drink enough to make the money back. Fortunately for our third cruise, we had the option to select the Unlimited Beverage Package as one of our “Free at Sea” freebies being offered as a promotion when we booked. Drinks can be pretty pricy on board ($10+ per drink) so having the package was really nice to alleviate additional on-board fees. HOW LONG SHOULD YOU CRUISE? Mike and I have never cruised for longer than 7 days. Any longer, and you might find more back-to-back days at sea (which I don’t totally love for sea sickness), or, any longer and we’re missing our cats and dogs way too much. (We already miss them a lot with a 7-day cruise lol). There are 3-4 day cruises (weekends/long weekends essentially), which I think would almost be too short, but I think people in Florida take advantage of that a lot. There are 11-day cruises, and I saw a Facebook video circulating about a 6-month cruise. There’s definitely something to be said about staying on the ship for *too* long, and potentially starting to feel a bit of cabin fever. I’d say 7 days is a pretty good amount, but we have seen lots of older cruise passengers stay on the ships as we get off. It’s definitely easier to cruise longer when you’re retired! But overall length of cruise is really going to depend on what type of vacation you’re looking for. We added 3 days of exploration in Rome before our cruise, and 2 days in Cinque Terre after our cruise. In theory we could’ve done a 14-day cruise, but we still wanted some non-cruise vacationing too. ARE THERE HIDDEN CHARGES WHEN YOU CRUISE? With Norwegian, you’re charged a daily “service fee” per person in your state room. This was about $15 USD per person, per day. Which definitely adds up. This is essentially their tipping / gratuity fee. So it’s sort of convenient, but I know a lot of cruisers don’t like it because they prefer to tip staff directly. If you’re not looking at your account throughout the cruise, this fee at the end can come as a bit of a shock and seem like a hidden fee. Everything else on the cruise ship is pretty straight-forward and clear when it comes to pricing. Staff will tell you if something isn’t included in your beverage package. There may be additional charges for a special show (shows with fees are less common than shows without). Or if you’re planning on gambling at the casino, or playing a game of Bingo, you’ll need to pay for that. If you want a massage, there’s obviously fees involved. There’s also that extra charge for room service. But again, all of those things are stated, and when we did almost order room service one time, the staff member reminded me that there is a service fee, so that’s helpful too. The cruise ship doesn’t want you to be upset or feel cheated, fees-wise, so they pretty much tell you when things are going to cost money over and above your base fare. You can get through your entire cruise without paying a single extra dollar (minus the gratuity/service fees) though they do make it easy to just charge any additional fees to your card. Over our last three cruises, cost per person has ranged in the $1,000-1,500 range. Mike loves balcony suites, so our cruise cost is a bit higher because you pay more for balcony. If you don’t care about window or balcony, your cruise can come in under $1,000. I’ve seen cruise prices as low as $600 per person and as high as $3,000—even higher if you’re booking one of the premium suites with access to premium, more private amenities. We think that $1,000-$1,500 range per person, for a 7-day cruise, is a great a deal, considering it covers 7 days of accommodations, 7 days of unlimited food, 7 days of that “resort” inclusive style vacation and service, and 7 days of travels to multiple locations in a specific region. That’s a lot being covered! Even better if you book with a promotion so you can get additional value add like unlimited drinks or specialty dining or Wi-Fi. Of course, you can still expect to spend more than what you spent on the cruise itself. You’ll need to factor in flights. You may book a shore excursion at a few ports. Or you may do independent exploration at the ports, which still requires money for train, bus, or activities. Even if you just hop off the boat for the day and grab lunch in town, that’ll cost you. You’ll get that service / gratuity charge, and you might buy additional food, drinks, photos, or pay for experiences on the ship that are not included in your cruise fare. You may also add a few days before or after your cruise to explore an area near where your cruise port is located—and with that comes additional costs. On the lower end, maybe factor in another $1,000 per person for just general spending, and $1,000 per person for flights (could be a lot cheaper depending on where your cruise sails from), and you’re likely looking at a $3,500-$5,000 per person cost for your cruise (roughly, again, could be cheaper or more expensive depending on a multitude of factors). So, it’s not necessarily cheap, but it also could very well be, depending on how you cruise (again, some people literally just stay on the ship all day long!) or how you plan your port activities, etc. SHOULD YOU CRUISE WITH A GROUP? CAN YOU CRUISE SOLO? Cruising with friends and family is quite common. I like when we can cruise with more people typically because I tend to fo to bed early, or nap during the day, so then Mike is off doing his own thing but I know it would be more fun for him if he had a friend or sibling to hang out with while I snooze lol. Group cruising is also practically better for shore excursions or activities in the ports of call. Mike and I opted for train and buses because there was just two of us, so those were the most affordable transportation options, though sometimes not the most convenient or smoothest. If you’re with a group, taking a cab or a private car makes a lot more sense because you can split the cost of the car. Splitting 4-6 or more ways can make it a lot more affordable, but would be ridiculous if Mike and I did it. For the longest time, cruises needed you to book a room on double occupancy, so if you were a solo traveller, cruising was usually not an option, or a financially smart option, until Norwegian launched its studio cabins back in 2010, with the Norwegian Epic! This was the first ship on the seas to remove its middle elevator, and turn that middle section into studio rooms for solo travellers. Now there’s lots of demand for these single rooms, and on our ship, they also have daily activities aimed at solo travellers (so maybe they meet someone!) The solo travellers also have their own private lounge area too. Overall, cruising is more fun with a partner or a group, but I think it’s cool that cruises now offer accommodations and activities for people travelling alone. SHOULD YOU DO SHORE EXCURSIONS? While cruises can be super relaxing, they can also be pretty go-go-go. Depending on how you choose to cruise. You might get into port at 7 a.m., and if you’re planning on heading into town, or going somewhere specific (30 minutes or an hour outside of the port town), you need to factor in commute and activity time, and generally want to be off the ship early so you can make it back to the ship before it sets sail again. So that can make for long, busy, and maybe even stressful days (if you’re like Mike, who is always worried about not making it back to the cruise ship on time, lol). Most cruisers do book shore excursions—these are different activities you can do in the areas where the cruise docks for the day. These are often touristy things, like—a shuttle bus to the Leaning Tower of Pisa, or a private taxi to explore the ruins of Pompeii. On a Caribbean cruise, it might be, a shuttle to the beach for a beach day, or a sea day on a Catamaran boat. Your cruise ship offers convenient shore excursions, but oftentimes the cruise-booked excursions are a lot pricier than if you booked online through a tour company, or just did some independent travel and exploration on your own. Our first two cruises Mike and I booked a shore excursion through the cruise ship at maybe 3 of our 7 stops. Our most recent cruise, we opted to do our explorations all on our own. There are advantages and disadvantages to booking through the cruise ship or doing it on your own. When you book an excursion through the cruise, one key advantage is that if your tour or activity runs late, and you miss the time you’re supposed to be back on board, the cruise ship will not leave you. That can bring you a lot of peace of mind. For cruise passengers who go out on their own, and maybe miss a train or the traffic coming back is terrible, they might wait 30 minutes for you but then they need to proceed. We learned that there are always independent exploration guests who get left behind each day at port. Always! And then it’s up to them to bus, train or fly to the next port to meet up with the cruise ship again. Can you imagine the hassle? So yeah, cruise ship waiting for you if you booked an official excursion through them, is a pretty huge perk. lol. But the biggest advantage to booking a third party tour or exploring on your own, is it’ll save you a significant amount of money. Some of the excursions can cost $200-$300 per person. We can go out on our own at a port and maybe the total cost is $50 for primarily travel. Maybe we get up to $100 if we stop and have a bite to eat. The cost savings are nice, but the stress of making sure you’re back in time, or the inconvenience of a bus or train that stops a bunch of times, might not be worth it or might not be your style of travel. Everyone is different! That’s also why earlier I recommend cruising with a group if possible, because then you can get a taxi or a private car when you get to port, and splitting the cost is a lot more affordable, while the ride itself is more convenient and comfortable. Sometimes when you get off at the port, you’ll find taxis asking if you want to ride share with others. If you make friends with people on the cruise ship, that might also be something you want to ask if they want to do before your next port! Finally, I would say that, if you’re not sure what excursion you want to do, or if you should book through the cruise ship, find a third party, or do it on your own, know that you can definitely make your decision the day of (or while you’re on the cruise ship). At every port, there are tons of taxis, shuttle busses, private tour operators that wait at the port and try to get you to book with them. If you have Wi-Fi or data, you can book online with a third party company and they’ll send someone to pick you up at the port, or give you instructions on where to meet to go on your excursion. You might want to book an excursion with the cruise one day then decide you want to try exploring on your own the next, and compare to see which you prefer before your next stop. OR, you can plan absolutely nothing at all! Stay on the ship. Or walk off and head into town for a couple hours casually before coming back. Whatever you want. There’s no right or wrong way to do it. It just all depends. TELL US MORE ABOUT YOUR WESTERN MEDITERRANEAN CRUISE! We really enjoyed our Western Mediterranean cruise. We did 7-days from Rome (Civitavecchia), and our itinerary was Livorno (Pisa/Florence), Cannes, France, Palma Majorca, Spain, Barcelona Spain, one day at sea, Naples, and back to Rome. As mentioned, for this cruise, we decided to explore on our own at the different ports, so we primarily took bus/trains to different points of interest at the stops. We also spent a few days in Rome before the cruise departed, and a few days in La Spezia/Cinque de Terre after our cruise. Below is a really short summary of what we did at each place we visited, but you can also read in greater detail about our travels to Italy in this blog post: Travel Tips for Italy, or this one: Travel Guide to La Spezia & Cinque Terre, Italy. Rome: Ate all the pasta and pizza. Saw all the touristy spots—Colosseum, Pantheon, Spanish Steps, Vatican. Livorno: Shuttle to downtown, train to Pisa. Visited the Leaning Tower of Pisa. Train to Florence. Visited the famous churches. Had a traditional Florentine lunch. Train back to Livorno. Shuttle to port. Cannes: Tender to port. Walked to the beach. Rented beach chairs and umbrella outside Plages de Sports. Tanned, swam and read books for several hours. Walked back to port. Tender back to ship. Palma Majorca: Rented electric bikes as soon as we got to the port. Biked 20 km (round trip) along the beautiful coast. Walked back to ship. Barcelona: Took the Hop On Hop Off Sightseeing Bus around the city, both the orange and green lines (North/south and west/east). Saw a bunch of Anthony Guida’s buildings, including his famed Sangrada Familia church. Ate tapas. Day at Sea: Sleep In. Eat. Take In a Presentation. Eat. Pool. Eat. Activities. Eat. Naples: Took bus to train station. Took train to Sorrento. Took bus to Positano Amalfi Coast. Walked all over Positano. Had pizza. Took bus and train back to Naples. Had deep fried pizza (traditional Napoli street food, pizza fritti). Walked back to port. La Spezia/Cinque Terre: This was after our cruise had finished, but I’d highly recommend adding a couple days to explore this area if you didn’t get to it through the Livorno port. We stayed in the lovely town centre. Took train to Cinque Terre five villages. Ate region specific cuisine like focaccia pizza, seafood cones, pesto pasta, and lots of gelato. Took lots of photos. Read more about our visit to La Spezia and Cinque Terre. Overall, the Mediterranean Sea and the various ports along it, are gorgeous. This was a really nice cruise and even though it was in late October, the weather was still wonderful at every single stop (though our one day at sea was very windy). Our one complaint would be that there was only one day at sea, and it came so late into the cruise, sometimes choosing an itinerary that starts with a couple days of sea gives you a more relaxed feel than an itinerary that just immediately gets to a port. Thanks for reading my Ultimate Guide to Cruising! Hopefully it answered your cruise questions and helps you make a cruise decision. As I said, Mike and I are definitely cruise people, and can’t wait to go on our next cruise! We love Norwegian Cruise Lines, but are open to trying other cruise ships too, to truly compare. If you have any unanswered questions about cruising, feel free to ask me in the comments below, or on social media! If you want to see some scenes from our Western Mediterranean Cruise as it was happening, check out my Instagram Story Highlight of the Cruise or some of my Instagram cruise posts! You can also get lots of information about cruising on Cruise Critic! And if you’re from Alberta, take a look at AMA Travel’s website for Cruise Deals too!